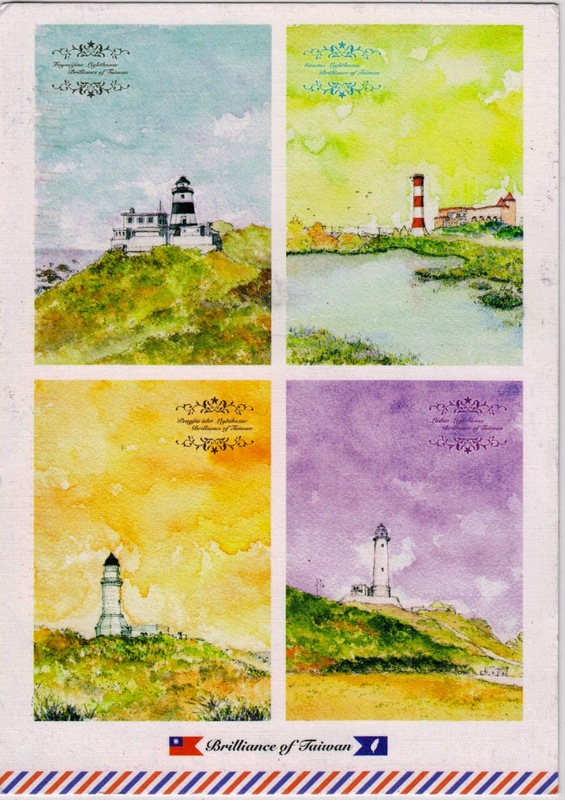 Postcard TW-1511134 from Taiwan features four beautiful lighthouses. Fugueijiao Lighthouse (富貴角燈塔: 25°17′54.3″N 121°32′11.8″E), shown on the top left, is the northernmost lighthouse on the main island in Taiwan located in Shimen District, New Taipei. Originally built between 1896 and 1897 under the Japanese rule for the construction of undersea cable between Taiwan and Japan, it was handed-over to the Republic of China in 1945. Only then it started to be used as a navigation aid. The lighthouse was opened to the public for the first time in June 2012. Gaomei Lighthouse (高美燈塔: 24°18′45.8″N 120°33′04.7″E), shown on the top right, was built in 1967 in Qingshui District, Taichung, Taiwan. The lighthouse ceased operation in 1982 and the lighting equipment was moved to the lighthouse in Port of Taichung. It re-opened as a tourist attraction on September 27, 2014. Pengjiayu Islet Lighthouse (彭佳嶼燈塔: 25 ° 37'44 "N 122 ° 04'48 "E), shown on the bottom left, was also built under the Japanese rule from 1906 to 1909 on Penjia Islet in Zhongzheng District, Keelung, Taiwan. The 3rd tallest lighthouse in Taiwan, it was ranked 12th among the 100 historical buildings in a 2001 contest. However, because Pengjiayu Islet is still under military control, the lighthouse is not open to public. Lyudao Lighthouse (綠島燈塔: 24°40′35.3″N 121°27′58.8″E), shown on the bottom right, was built in 1939 in Cape Bitoujiao, Green Island, Taitung County, after the SS President Hoover, a Dollar Steamship Lines ocean liner that provided a trans-Pacific service between the USA and the Far East, ran aground on an island reef off Taiwan on December 11, 1937 and was declared a total loss. The construction cost was provided by the American Red Cross as a thank-you-gift to the local people who had rescued the passengers of the ship. The lighthouse was destroyed during World War II but was rebuilt in 1948. The lighthouse was not opened to the public until September 2013. It was designated as a historical building in Taitung County.